Courtesy Marco De Nadai and Jacopo Staiano. Poor urban planning is notorious for ruining cities all over the world. Today, data mining techniques are providing the evidence needed to make cities safe and vibrant places to call home. Urban planning has suffered for a lack of evidence. Jane Jacobs predicted pedestrian focus as a key metric for vibrancy. Scientists use modern data mining techniques to verify Jacobs' theory. According to researchers Marco De Nadai from the Fondazione Bruno Kessler - University of Trento and Jacopo Staiano of University Pierre and Marie Curie - Sorbonne Universities, that’s exactly what you should do. Bringing data mining to urban planning, they’ve confirmed what it takes to keep a city vibrant. In 1961 Jane Jacobs wrote the seminal book in urban studies, Death and Life of Great American Cities. Pedestrian activity is central to the health of cities, she argued. Encroaching infrastructure, insofar as it eliminates pedestrian activity, hastens the demise of a city. The more foot traffic occupies a street (increasing face-to-face encounters), the safer that street will be, and the more economically viable it is apt to be as well. By 2030, close to 1/10 of the world will reside in just 41 mega-cities, each housing more than 10 million inhabitants. According to Jacobs, a diverse use of urban space, diverse building size and use, small city blocks, along with a sufficiently dense concentration of population, ensure pedestrian interaction and thus a dynamic urban environment. Though an intuitive and influential theory, corroboration awaited empirical evidence. In 2015, researchers in Seoul completed an exhaustive 10-year study of pedestrian surveys verifying Jacobs' work. 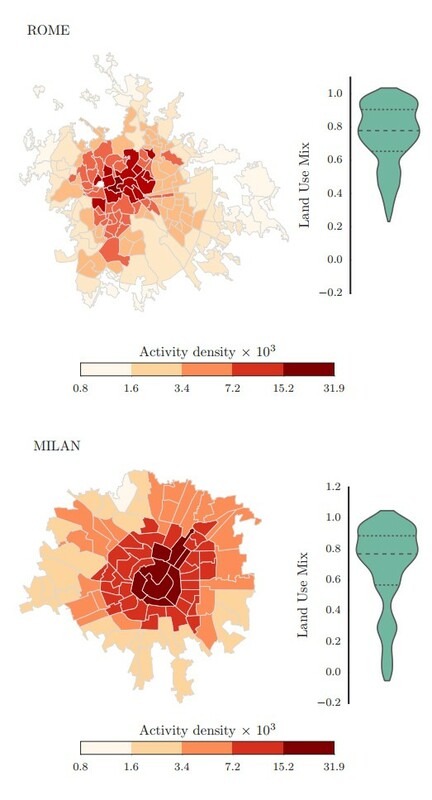 Employing much quicker methods, De Nadai and Staiano measured human activity in six Italian cities, and found that Jacobs’ conditions for city vitality are accurate. To calculate urban diversity, the researchers mined public and commercial databases; to assess urban vitality, they mined call data records. The analysis focused on six Italian cities, with a combined population of roughly 10 million people. The records varied by source — public databases, cell phone records, social networks — and spanned 2006-2012. Their analysis shows that active Italian districts consist of dense populations of office staff, are within walking distance of so-called ‘third places,’ and are replete with small streets and historical buildings, just as Jacobs' diversity metric suggests. The authors argue that urban sprawl poses a health risk not only to city inhabitants and wildlife, but also to the very cities themselves. Sprawl presents a problem to urban planners and residents because commuting consumes time and energy. This means transportation budgets are increasingly swallowed by automobile-oriented facilities. This focus fosters security issues and health problems, and skews the urban design for decades or even centuries. 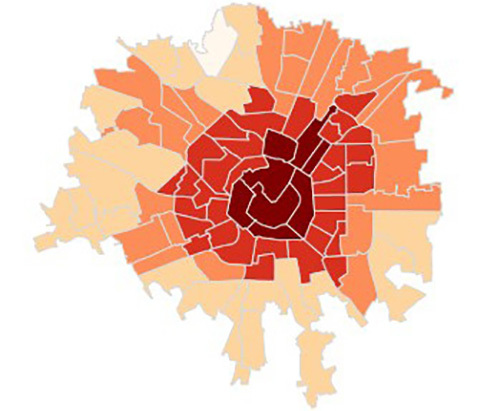 In short, through modern data mining, the researchers have verified Jacobs' urban planning theories and provided a framework for healthy urban design criteria. By 2030, close to 1/10 of the world will reside in just 41 mega-cities, each housing more than 10 million inhabitants. With more and more people living in closer and closer spaces, smart planning is crucial to avoid the hollowed out urban experiments from the late 20th century. Verifying Jacobs, De Nadai’s team has taught new tricks to a beloved old dog.